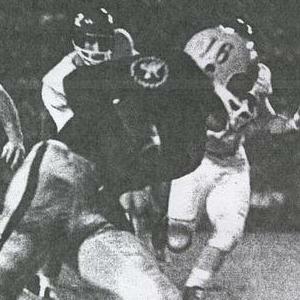 Kush continued to have success as the Sun Devils rolled through '59 10-1, losing only to San Jose State. QB Joe Zuger, tackle Jess Bradford and HB Nolan Jones, the country's second leading scorer led the team and their reward was an extra game versus Hawaii. Bradford, Jones, and end Bill Spanko were further rewarded with All Conference honors. The program was still somewhat unknown off of the West Coast but momentum was building with high-powered offensive football. Kush made a change in the helmet presentation, with the three-inch maroon side numerals worn in �, replaced by those in a shade of Cardinal in the Pacific Angelus style on the sunflower shell with the one-inch maroon center stripe. Many of the players were also wearing the white plastic Adams face mask for the � season. Zuger, Jones, and Bradford, the latter two repeating as All Conference choices, again were the big names in '60, but the fall-off to 7-3 included losses to nemesis San Jose State and Arizona.